The best measure of any hotel stay often occurs at checkout time—when you wish you didn’t have to leave your room. That is the way my husband and I felt at the end of our three-night stay at the Four Seasons Hotel Gresham Palace in Budapest, Hungary. Not only did we enjoy our first visit to this European capital but we also fell in love with the place we came home to each night. That this gracious art nouveau hotel has a palatial feel is not surprising. Although it never served as a palace, per se, the building has had a storied history. The Gresham Palace first opened in 1906 as the overseas corporate headquarters of the London-based Gresham Life Assurance Company. Its grand scale was an intentional effort to showcase the company’s wealth, and also to provide upscale residences for bankers and their families. Before long, the beautiful Gresham Palace also became the site of one of the most popular coffee houses in the city, welcoming its intellectual elite. The building was designed by the leading Hungarian architect of the time, Zsigmond Quittner, and was decorated by craftsmen who were masters in their respective arts—such as mosaics, glass painting, and silver and ironwork. Workers from the celebrated Hungarian Zsolnay Porcelain Factory made the more than one million mosaic tiles covering the ground floor. After World War II, the building housed Russian soldiers and then was seized by the Hungarian Communist Government. They divided the property into small units that housed as many as 10 people in a room. (Prior to that, some of the apartments, of which there were only 2 or 3 on each of the five floors, had as many as 17-rooms each.) Sadly, the once-beautiful building fell into a state of neglect and disrepair. However, the Gresham Palace, which survived two World Wars, gained a second life when the Canadian-based Four Seasons corporation purchased the property from the state government in 1999, undertaking a costly five-year restoration that totaled more than $100 million. The company brought in some of the finest Hungarian craftsmen, who lovingly restored the Palace using some of the same techniques as their predecessors. The new luxury hotel opened its doors in June 2004 and has since entertained celebrities and dignitaries from around the world. It is reported that Anthony Hopkins, Bruce Willis, Busta Rhymes, and Brad Pitt and Angelina Jolie stayed there while visiting or filming movies in Budapest. Sophia Loren chose the hotel as the site for her son’s wedding. When we were shown to our room, our eyes were immediately drawn to its oversized, wood-framed double windows that opened to panoramic views of the Danube. The river divides the city into its two parts, Buda and Pest, and the hotel is located on the east (Pest) side facing the iconic Chain Bridge, the Buda Palace, and the scenic hills that form a backdrop behind them. Our room #210, a spacious Danube river-view room, was tastefully decorated in art deco furniture in dark woods, complemented by beige and seafoam green upholstery that included a comfortable chair with an ottoman. The white walls and large transom over the opening windows filled the room with light. After our second night, my husband and I agreed that this was the quietest hotel room we had ever stayed in. That absolute quiet–coupled with a comfortable king bed with fluffy white duvet and down pillows—made it easier to overcome jet lag from the long trip from the States. There was ample closet and counter space that made it convenient to unpack and install ourselves in the room. The large marbled bathroom had a separate tub and stall shower, and the toilet was placed in a separate privacy alcove. The hotel provides guests with L’Occitane en Provence soaps and toiletry miniatures. Internet access and bottled water at turndown was free as well as a copy of either the International New York Times or Wall Street Journal each morning. The hotel is located around the corner from the lively pedestrian street that leads to St. Stephen’s Cathedral, making it convenient for walking, sightseeing, shopping and taking advantage of nearby cafés and the emerging restaurant scene. With 179 rooms (including 19 suites with vaulted ceilings), it falls in the mid-size category of hotels. While palatial in terms of high-ceilinged rooms and elegant public spaces, the scale is such that it never feels impersonal or overwhelming. Standing in the modern t-shaped lobby with its ironwork gates, glass ceilings, dramatic chandeliers and beautiful marble staircases accented with contemporary artwork and sculptures, it’s hard to imagine horse-drawn carriages once carried guests through it. We didn’t have time to use the luxurious, light-filled spa located on the fifth-floor (always nice when a hotel spa isn’t located underground) but a quick walk-through of the premises left us impressed. Its centerpiece is a Zen-like, contemporary 12-meter infinity lap pool surrounded by lounge chairs where guests can relax regardless of whether or not they book spa treatments. This totally renovated top floor of the hotel, that once housed kitchens and service quarters, now also includes a spacious health club, a whirlpool, sauna, steam room and seven treatment rooms. Many of the beauty products used and sold by the spa are made locally. The informal Gresham Restaurant features all-day dining with menus showcasing Hungarian and Italian-influenced dishes. We enjoyed wonderful breakfasts there with freshly baked pastries and homemade jams. Hungary is one of only two countries in the world where you can eat goose liver. At the Gresham, you can even get the delicacy with your eggs. All the food was cooked a la minute, and the multilingual wait staff was attentive and knowledgeable about the dishes they served. Two large glass walls make the restaurant perfect for people-watching or soaking in the views of the Danube. If you visit the Gresham Palace, be sure not to miss the Lobby Bar and Lounge. A cozy lounge with banquettes spills over into an area with small tables in the lobby. It’s a totally relaxing setting to enjoy one of the hotel’s signature cocktails, local wines, or a light snack. The bartenders go out of their way to make sure you are comfortable and satisfied. 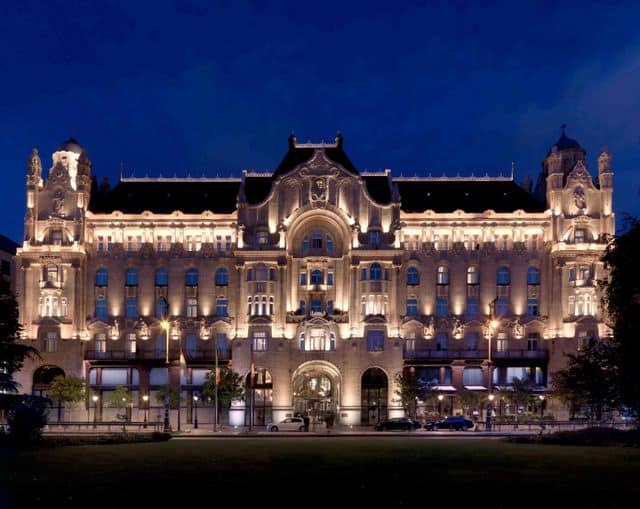 The Four Seasons Gresham Palace has received many accolades since it opening and the 2013 Conde Nast Readers Choice Awards recently ranked it the top hotel in Central Europe. We’re not surprised. It couples a romantic and elegant setting with the highest levels of efficiency and personal service associated with the Four Seasons brand. Disclosure: We paid a media rate for stay at Four Seasons Gresham Palace. Any opinions expressed in this post are our own. I loved so many things about the Four Seasons Gresham Palace and your photos are making me anxious to get back there. (Happy to say that will be very soon!) The gorgeous architectural and design details, the view, the food, the service and so on! As you mentioned at the beginning of your post — we really did not want to leave the hotel at checkout time. Nice writeup and photos. How much was the media rate? The lower it was, the more reluctant you would be to check out. You’re an honest writer, but the rate disclosure would be more meaningful as an exact amount mentioned near the beginning rather than buried at the end. What a special place – love the descriptions and all the photos.